At Puri, Shri Jagannath Mahaprabhu welcomes you to his ancient shrine with the melodious sound of hymns and mantras, the playing of conches and drums and the perfume of flowers and incense. The Jagannath Temple, also called Shrimandir, is at the heart of the town of Puri. It stands on the grand avenue called Bada Danda and is at the centre of the spiritual and daily life of this tirtha. The temple with the tall soaring shikhara has a huge chakra and a flag flying on top and from the sea it is visible from far away. The festival processions like the Rath Yatra all take place on the Bada Danda. Within the temple precinct there are many smaller shrines dedicated to various deities, pavilions, gardens and sacred tanks. The temple is a gigantic enterprise and it employs over six thousand priests from thirty six clans. The religious rituals and festivals are unique to Puri as there is the involvement of not just Brahmin priests but also members of the Sabar tribal community called the Daitapatis who continue to create and maintain the images. The administration of the temple was organised eight hundred years ago by King Anangabhima Deva of the Ganga dynasty who donated treasures in gold and also gave land to pay for its upkeep. Even today the king of Puri is considered to be the premier servant or sevak of Lord Jagannath and his presence is required to begin the Rath Yatra. The history and the many legends woven around the temple can be read in the temple chronicles called the Madalapanji. Legends say there was a temple at Puri for thousands of years. Historians date the present temple to the 12th century and the rule of the Ganga dynasty. 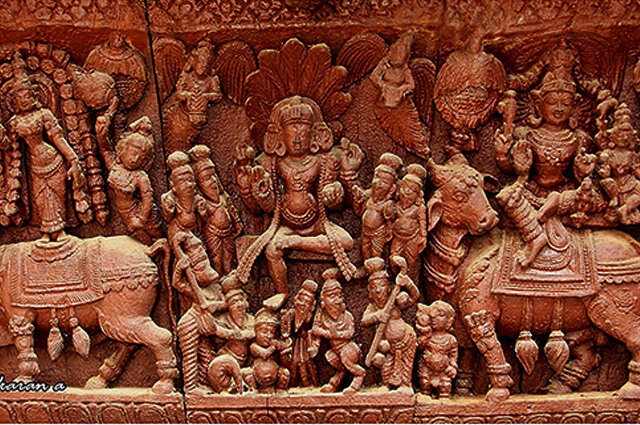 It was begun by King Chedabhima Deva and completed by his son Anangabhima Deva. The architectural design follows the layout of all Orissa temples and the temple is similar to the Lingaraja Temple of Bhubaneswar though it is much larger. The temple was attacked by the Muslim general Kalapahad in the sixteenth century and it was restored by later kings of Orissa. They also built the high walls turning the temple compound into a medieval fortress. In the nineteenth century King Ranjit Singh of Punjab donated gold and jewels to the temple and it is said that in his will he had donated the Kohinoor diamond to the temple but it was taken away by the British to London and presented to Queen Victoria. The Jagannath Temple, called Shrimandir by the locals, was built facing the east to catch the first rays of the rising sun. The temple precinct covers over ten acres and is surrounded by two walls. The outer wall is called the Meghnada Prachira and the inner wall is the Kurma Bheda and the walls are pierced by gateways. The main sanctum called the Bada Deul with the tall curvilinear spire called shikhara has an attached pillared assembly hall called the Jagamohan. These were built first and then the hall of offerings, the Bhoga Mandapa and the dance hall, the Natya Mandapa were added probably in the 14th century during the reign of the Gajapati dynasty. There is a giant wheel made of eight metals on top of the spire, this is Vishnu’s discuss and is called Nilachakra and a huge flag flies over it. The temple precinct is surrounded by a high wall pierced by four gateways. The main entrance from Bada Danda is called Simhadwar or the Lion’s Gate and it is guarded by two stone lions. This is the gate from which the deities are taken out to be placed in the chariots for the Rath Yatra. Right behind the gate there is a small image of Jagannath that is visible from the road called Patit Pavana. This image can be viewed by non-Hindus who are not allowed to enter the temple. 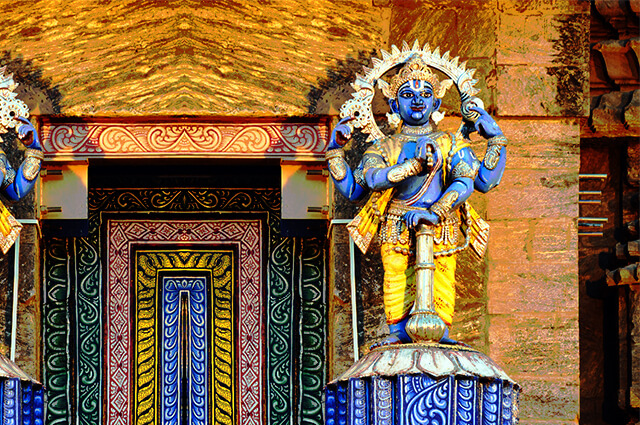 The images of two temple guardians called Jaya and Vijaya stand at the gate. The other three gates are guarded by elephants, called Hastidwar; horses, called Ashwadwar and by tigers, called Vyaghradwar. There are twenty two steps that take devotees inside from the Simhadwar and these are considered sacred and are called Baisipahacha. Beyond the steps on the left is the temple kitchen where the Mahaprasad is prepared and on the right the Ananda Bazaar where the Mahaprasad is sold to pilgrims. There are two sacred pillars within the precinct. The first is a beautiful column made of chlorite called Aruna Sthambha right before the Simhadwar. On top of the eleven metre high column is the image of Aruna, the god of dawn who drives the seven horse chariot of the sun god Surya. The pillar was brought here from the sun temple at Konarak. The second pillar called the Garuda Sthambha stands before the sanctum. It is said that the saint-poet Chaitanya Mahaprabhu used to stand here to say his prayers to Jagannath. In the sanctum or grabha griha the deities are placed on a pedestal called Ratna Simhasan or Ratnavedi, the throne of jewels. Beside the images of Jagannath, Subhadra and Balabhadra there is also a log of wood that symbolises Vishnu’s discus Sudarshana Chakra. Around them are images of the goddesses Lakshmi and Saraswati Shridevi, Bhudevi and Lord Nilmadhav. The outer walls and pillars of the temple are covered with carvings. NOTE: Non-Hindus are not allowed inside the temple. Visitors can view the temple from across the road from the Raghunandan Library. Everyone can view the images of Jagannath, Subhadra and Balabhadra during the Rath Yatra. There are a number of smaller shrines, open pillared halls called mandapas, sacred tanks and wells within the temple precinct. There are over thirty smaller temples dedicated to various gods and goddesses scattered around the temple complex. Two of the smaller temples, one dedicated to the goddess Vimala and the other to the Vishnu avatar Narasimha are believed to be older than the present Jagannath Temple. The Mahaprasad that is offered to Jagannath is also then offered to Vimala and only then is it considered to be a consecrated food. The Vimala temple is considered a shakti peetha where the feet of the goddess Sati fell. There are also shrines to Lord Rama, Ganesh and Mahalakshmi. Among the other temples are shrines to the goddesses Saraswati, Bhuvaneshwari and to Hanuman. The pillared halls or mandapas include the Mukti Mandapa, a sixteen pillared hall where members of the Chhattis Niyoga sit. These are the representatives of the thirty six Brahmin clans who were originally selected by King Anangabhima to run the various departments of the giant enterprise of the temple. They sit here to answer questions on religion, theology and rituals and in important matters the group is headed by the Shankaracharya of Puri. The Dola Mandapa has a beautifully carved arch on which the swing festival called Dol Yatra is held every year. Devotees also bathe in the five sacred tanks called Pancha tirtha within the temple complex. These tanks are called Indradyumna, Rohini, Narendra, Markandya and Swetaganga. Devotees often also bathe in the sea before entering the temple for the puja rituals. NOTE: The sea at Puri is very turbulent and visitors are warned about the high waves and only good swimmers should venture into the sea. If you plan to bathe in the sea please take the help of the nuliya fishermen to guide you. They are easy to spot as they wear a conical hat. The pujas start every morning with the playing of drums called Dunduvi Vadya. The daily worship schedule includes arati with the waving of lamps, incense and flowers before the deities to the chanting of mantras and also the five bhogas when the deities are offered food. The deities are also clad in new sets of clothes after every bhoga ceremony. The daily pujas are called Nitis and follow a daily schedule. There are also periodic Nitis performed during dates of the lunar calendar of ekadashis, sankrantis and amavasyas with their special rituals. Devotees can watch the puja and bhog ceremonies from the Jagamohan hall. Twice a day in the morning and evening there is the period called Sahana Mela when devotees are allowed to enter the garbha griha and move closer to the Ratnavedi and pray to Jagannath. The Mahaprasad of Puri is the meal that Lord Vishnu partakes from every day and it is a legend across the world and they say that the cooking is supervised by the goddess Mahalakshmi. A total of fifty six dishes called Chhappan Bhoga are offered to the deities in five offerings during a day. During some festivals like Makar Sankranti the number of dishes rise to an astonishing eighty two and it is claimed that the kitchen can feed up to one hundred thousand people in a day. The dishes are all cooked in a kitchen said to be the largest kitchen in the world with Brahmin cooks labouring over a huge number of ovens. The menu includes cooked rice, various dals, vegetables, curry, sweet dishes, fries and dry confectionaries. These are cooked over a row of wood fires in earthen pots and then carried in slings to the temple. Here the food is offered first to the trinity of Jagannath, Subhadra and Balabhadra in the main temple and then to the goddess Vimala. Later the consecrated Mahaprasad is sold to devotees in the Ananda Bazaar. This extraordinary temple in Puri is the world of Jagannath Mahaprabhu and offers a unique spiritual experience.